iJailbreak: 1.1.3 Firmware Update via WiFi with Installer! Jeez, just when you thought updating your iPhone to 1.1.3 firmware couldn’t get any easier, it gets even better with the recently released, iJailbreak! This 1.1.3 firmware update/jailbreak is possible without a computer, as the entire process takes place online via WiFi! That’s right–you can update to 1.1.3 right over the air! This update is only for jailbroken 1.1.1 or 1.1.2 iPhones or iPod Touches (OTB 1.1.3 iPhones will not work) and will take approximately 45 minutes to complete.The entire process is through Installer and a wireless internet connection, so make sure that you plug in your AC adapter to your iPhone and ensure you have a nice, solid WiFi connection (the faster the better). First things first, go to Settings–>General–>Autolock–>Never. Next, make sure that Installer has been updated to the latest version, as well as the BSD Subsystem. Launch Installer and add the following source: http://ijailbreak.com/repo.plist (Sources –> Edit –> Add –> http://ijailbreak.com/repo.plist) and then “refresh” your sources. Go back to the Install menu, and you should see a category labeled “iJailbreakMobile”. From here, you need to choose either 1.1.1 or 1.1.2, depending on which jailbreaked firmware you are running. Install iJailbreak and exit Installer. The Springboard should reload and then you will see the app iJailbreak. Run the program. You’ll be asked a few questions during the setup, then the install will take place. The reason it takes so long is that it downloads the entire 1.1.3 update over WiFi from Apple. It should take about 45 minutes, and at time it may look like it’s frozen–but let it run. 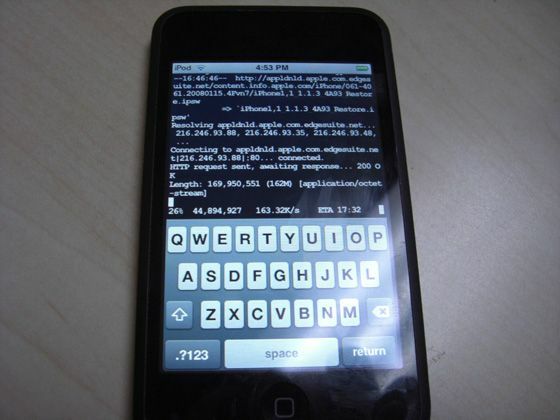 If successful, the iPhone will reboot and it will be in 1.1.3 firmware. Once completed, launch Installer and install “Remove 1.1.3 Upgrade Data” only if you’re coming from 1.1.1, to remove the space taken up during the install. That’s it! Enjoy your 1.1.3 firmware! Credit for this tutorial goes to 13 year old AriX (send a donation if it works for you) and CrunchGear. This has got to be the easiest firmware upgrade ever…however, I for one, am not going to upgrade just yet. Why? Well, there are many problems and bugs users have run into with 1.1.3, such as increased dropped calls and right now I don’t have the time to deal with them–as I need my iPhone for work!